SUMMARY. Neuropsychiatric symptoms (NPS) are common in the prodromal stage of dementia and can precede the onset of cognitive impairment. The presence of NPS in cognitively normal patients or in patients with Mild Cognitive Impairment (MCI) is associated with an increased risk of progression along the neurodegenerative process. The need to identify, in the early stages of the disease, the population at risk of cognitive decline has led to the formulation of the concept of Mild Behavioral Impairment (MBI). This neurobehavioral syndrome is characterized by late-onset sustained psychiatric symptoms, in patients without cognitive deficits or in those with MCI, identifying a condition associated with an increased probability of conversion into dementia. MBI represents the neurobehavioral axis of pre-dementia risk states, as a complement to the neurocognitive axis of MCI. For some, MBI may be the initial manifestation of neurodegenerative disease, observed before cognitive impairment is apparent. The Mild Behavioral Impairment-Checklist (MBI-C) was developed on the basis of the MBI diagnostic criteria, established by the International Society to Advance Alzheimer’s Research and Treatment (ISTAART). The MBI-C allows to identify, in a standardized way, patients with MBI and to follow the course of their neurodegenerative disease. This article describes the creation of the MBI-C scale and presents its Italian version. KEY WORDS: Mild Behavioral Impairment, Mild Cognitive Impairment, subjective cognitive decline, MBI-Checklist, dementia, neuropsychiatric symptoms. RIASSUNTO. I sintomi neuropsichiatrici (NPS) sono comuni negli stadi prodromici della demenza, e possono precedere l’esordio dal declino cognitivo. La presenza di NPS in pazienti cognitivamente normali o con Mild Cognitive Impairment (MCI) è associata a un maggiore rischio di progressione della malattia neurodegenerativa. La necessità di individuare, in una fase precoce, la popolazione a rischio di deterioramento cognitivo ha determinato la formulazione del concetto di Mild Behavioral Impairment (MBI). Questa sindrome neurocomportamentale è caratterizzata da sintomi psichiatrici persistenti a insorgenza tardiva, in pazienti senza deficit cognitivi o con MCI, individuando una condizione associata con una aumentata probabilità di conversione in demenza. Il MBI individua la dimensione comportamentale dei quadri a rischio di demenza (asse neurocomportamentale), così come il MCI ne individua i disturbi neurocognitivi (asse neurocognitivo). Per alcuni l’MBI rappresenta la manifestazione iniziale della malattia neurodegenerativa, osservabile prima che il declino cognitivo diventi apparente. La Mild Behavioral Impairment-Checklist (MBI-C) è stata sviluppata sulla base dei criteri diagnostici dell’MBI, stabiliti dall’International Society to Advance Alzheimer’s Research and Treatment (ISTAART). La MBI-C permette di identificare, in modo standardizzato, pazienti con MBI e di seguire il decorso della loro malattia neurodegenerativa. Questo articolo descrive la creazione della scala MBI-C e presenta la sua versione italiana. Parole chiave: Mild Behavioural Imparment, Mild Cognitive Impairment, declino cognitivo soggettivo, MBI-Checklist, demenza, sintomi neuropsichiatrici. Neuropsychiatric Symptoms (NPS) are behavioral disorders and psychiatric symptoms frequently associated with neurodegenerative diseases; this definition includes mood disorders, anxiety, psychotic symptoms, neurovegetative disorders (sleep and appetite disturbances) and behavioral alterations such as agitation and aggression1. NPS are considered as ‘non-cognitive’ symptoms of dementia and described in the Anglo-Saxon literature as Behavioral and Psychological Symptoms of Dementia (BPSD)2. It has been calculated that 80% of patients with dementia have one or more NPS3 and their frequency increases with the course of the disease. NPS are associated with a more rapid disease progression4, a worse quality of life5, as well as a greater stress burden for family members and caregivers6,7. A working group of the International Society to Advance Alzheimer’s Research and Treatment (ISTAART) is dedicated to the study of NPS8. The appearance of NPS often precedes the onset of cognitive symptoms of dementia9; if the NPS are present, besides leading to high social and economic costs10, they seem to predict an evolution towards more severe forms of dementia and an earlier exitus11. Thus, ISTAART has published extensively on the importance of non-cognitive prodromes to dementia12. Recent data indicate that the onset of NPS in the elderly, in the absence of cognitive deficits, may represent an early marker of cognitive decline and promote the risk of progression along the continuum of neurodegenerative pathology, from Mild Cognitive Impairment (MCI) to dementia13. A prospective cohort study, the Mayo Clinic Study of Aging14, highlighted that the presence of NPS (particularly agitation, apathy, anxiety, irritability or depression), in a sample of cognitively normal elderly patients, increases the risk of developing MCI. From this same study it appeared that the presence of NPS is a predictive factor of MCI onset, more significant than the neuroimaging data of hippocampal atrophy. In another study conducted on 873 patients between 70 and 90 years, the Sydney Memory and Aging15, a significant association was observed between some NPS, in particular anxiety and agitation, and a cognitive decline in the following 2 years. Lastly, in a 4-year follow-up study of 644 cognitively healthy elderly patients, it was observed that the presence of depression and apathy was associated with an increased risk of conversion into dementia16. These results indicated the need for closer control over time in this type of patient. NPS are very frequent in patients with MCI, from 50%17 to 59%18 of cases, depending on the studies evaluated (epidemiological or clinical); depression (27.0%), apathy (18.5%) and irritability (19.4%) are the most commonly reported symptoms19. The presence of NPS in patients with MCI is associated with a greater severity of cognitive impairment and a greater impairment of functional adaptation, with a higher risk of progression towards dementia18,20,21. While the risk of evolution in dementia for patients with MCI is 12% per year22, the risk of evolution in dementia doubles, up to 25 % per year20 in the presence of one or more NPS (in particular apathy and depression)21. Assumptions are made regarding the relationship between the presence of NPS symptoms and the incidence of the neurodegenerative disorder. It is possible that NPS (especially those in the affective sphere) could represent the early manifestation or the epiphenomenon of an underlying neurodegenerative disorder23,24. Alternatively, a common substrate (represented by the neurodegenerative process) could be the cause of both cognitive and NPS manifestations. The last possibility identifies the interaction between biological and neuropsychiatric factors as the cause of cognitive impairment14. NPS are currently recognized as a central clinical manifestation of dementia; as early as 2011, the National Institute on Aging-Alzheimer’s Association (NIA-AA) recommends including in the diagnosis of dementia the onset of «changes in personality, behavior, or comportment symptoms that include: uncharacteristic mood fluctuations such as agitation, impaired motivation, initiative, apathy, loss of drive, social withdrawal, decreased interest in previous activities, loss of empathy, compulsive or obsessive behaviors, socially unacceptable behaviors» 25. The percentage of patients with NPS increases with the progression of dementia; a 5-year follow-up study reports that 97% of patients with dementia have at least one psychiatric symptom (Cache Country Study of Memory Health and Aging - CCSMHA)26; the most frequent neuropsychiatric disorders are apathy (36%), depression (32%) and agitation/aggression (30%)3. The presence of neuropsychiatric symptoms in dementia leads to a worse prognosis, a more rapid cognitive decline11, a greater impairment of daily functions27, an increased risk of auto/hetero-aggressive behavior1 and an early institutionalization6. In the behavioral variant of frontotemporal dementia (bv-FTD) the NPS symptoms may be the first manifestation28; also Alzheimer’s dementia (AD), vascular dementia (VaD)29 and some subcortical forms, Lewy body dementia (LBD)30 and Huntington’s disease (HD)31, can begin with behavioral disorders and psychiatric symptoms. According to a recent review of the literature32 about 28% of patients with a neurodegenerative disease have previously received a psychiatric diagnosis, most often depression. A psychiatric disorder is more frequently diagnosed at the onset of bv-FTD (52% of cases), compared to semantic dementia (24%) and AD (23%). A misdiagnosis of a neurodegenerative disease can delay the application of the most appropriate investigation and treatment protocols for this type of patient, worsening the course and prognosis. Above all, the treatment of psychiatric syndromes associated with neurodegenerative diseases requires particular attention in the choice of drugs and in the management of therapy, to avoid both the risk of iatrogenic syndromes and the rapid progression of cognitive deficits. For these reasons, psychiatric symptoms that first appear in adulthood and older age always require an accurate multidisciplinary specialist evaluation (psychiatric, neurological, neuroradiological). NPS are frequent not only in dementia, but also in patients with MCI and in elderly subjects without cognitive deficits. The presence of this symptoms worsens the prognosis for all these patients, increasing the risk of evolution in dementia and mortality33. Proper early identification of NPS and their appropriate treatment could slow or mitigate both the severe psychiatric complications of dementia and the appearance of cognitive symptoms. The concept of Mild Behavioral Impairment (MBI) was born initially in order to identify behavioral manifestations that precede frontotemporal dementia (FTD) and that for a long period of time may be the only clinical manifestations of the disease28. Taragano et al.34 selected a sample of patients with NPS without cognitive impairment and monitored them for 3 years. At the end of follow-up, 36% of patients had developed a FTD, 28% an AD, 18% a VaD and 18% an another type of dementia. The authors defined MBI as a clinical presentation characterized by changes in behavior (in particular disinhibition) and mild psychiatric symptoms, which can not be classified in other mental disorders, lasting no less than 6 months. According to the authors, MBI represented an intermediate stage in the evolution between normality and dementia. According to the diagnostic criteria of Taragano et al.34 a diagnosis of MBI also required a minimum age of 60 years, the absence of severe cognitive impairment and the ability to perform normal daily activities autonomously (Table 1). De Mendonça et al.35, in part subsequently modified the initial concept of MBI34, proposing criteria for a FT-MCI in which cognitive, behavioral and neuroimaging parameters were combined. The diagnosis of FT-MCI was applied to subjects who presented symptoms indicative of a fronto-temporal deficit and impaired executive functions, who nevertheless maintained adequate functioning in daily activities. 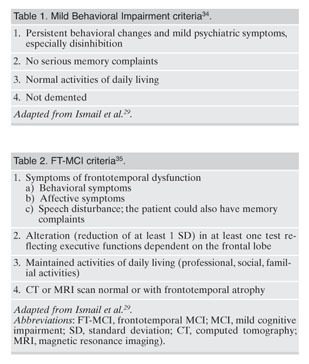 Neuroimaging examinations may be normal or indicative of frontotemporal atrophy (Table 2). Criteria proposed by Taragano and Allegri34 and by de Mendonça et al.35 proved to be useful for early diagnosis of the bv-FTD which, as we have mentioned, at the onset is diagnosed and treated as a psychiatric disorder in about 50% of cases29. Evidence that dementias other than FTD can also begin with NPS brought about the need to change the diagnostic criteria proposed for MBI, and to describe explicitly the relationship between MBI and MCI, in order to make this diagnosis useful in clinical practice and to identify earlier patients at risk of cognitive decline and dementia. The initial discussion about the need to develop new criteria for MBI took place at the annual meeting of the NPS Professional Interest Area (NPS-PIA) of the ISTAART during the Alzheimer’s Association International Conference (AAIC) of 2012 in Vancouver, Canada. After reviewing the literature, an international working group, led by Zahinoor Ismail, proposed new MBI diagnostic criteria, inspired by the criteria of Taragano and Allegri34, de Mendonça et al.35 and by those of the NIA-AA related to AD29. The underlying assumption of this working group, derived from both literature and clinical experience, was that neurodegenerative disease may occur even before cognitive impairment, with personality changes or behavioral and psychiatric symptoms. The new diagnostic criteria for the ISTAART MBI29 were refined over time and then presented at the AAIC 2015, in Washington D.C.
MBI refers to a late-onset syndrome (from the age of 50 onwards), in which the psychiatric symptoms/behaviors, not better classified in other nosological diagnoses, may be the early manifestations of a neurodegenerative disorder29. 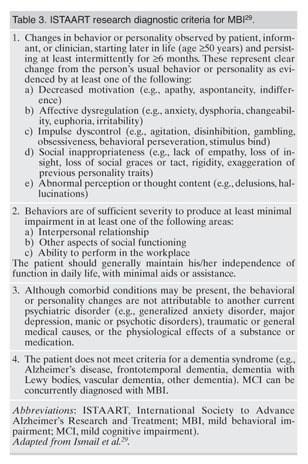 To diagnosed MBI according to the ISTAART criteria29 (Table 3), at least a minimal functional impairment needs to be observed, due to the presence of NPS in the following main domains: reduction of motivation or drive, affective dysregulation36, impulse dyscontrol, social inappropriateness24 and abnormal perception or thought content37. These alterations must persist for at least 6 months and must cause an impairment of interpersonal, social or work functioning, however not severe enough to compromise the independence of the patient, who manages to maintain his autonomy with minimal help or assistance. MBI can also be diagnosed in cognitively normal subjects. While a diagnosis of dementia is a criterion of exclusion, diagnosis of MCI may be present, although functional alterations must be attributable to NPS and not to cognitive symptoms38. In the criteria it is also specified that the NPS that arise after the diagnosis of dementia can not be considered as symptoms of MBI29. The target of the MBI ISTAART criteria is to identify late onset psychiatric symptoms as a marker of a prodromal and preclinical stage of neurodegenerative disease and to obtain an instrument applicable in clinical practice for the validation of the MBI in terms of nosological, epidemiological, neurobiological and treatment response perspectives. Furthermore, identifying the population with MBI, could represent a new approach to study strategies for the prevention and treatment of neurodegenerative diseases, assuming that the use of existing drugs (and of those that will be available in the future) in the early stages can increase their efficacy in modifying the course of the disease. Once the clinical concept of MBI was developed and the diagnostic criteria were listed, it became necessary to define and validate a tool for its evaluation. The most used rating scales for the detection of NPS are the Neuropsychiatric Inventory Questionnaire (NPI-Q)39, the Behavioral Pathology in Alzheimer’s Disease (BEHAVE-AD)40, the Cohen Mansfield Agitation Inventory (CMAI)41 and the Neurobehavioral Rating Scale (NBRS)42, but these are not sufficiently specific to identify behavioral and psychiatric symptoms in the patient with MBI, in part due to the short reference range (2-4 weeks) in these scales since MBI requires a 6-month symptom duration. Over that short time period (2-4 weeks), transient and reactive states can manifest as NPS and potentially provide false positive results. Furthermore, the rating scales listed above were developed for patients diagnosed with dementia, often not self-sufficient or functionally independent but rather who were institutionalized and with symptoms on average more serious than patients with MBI. Thus, in healthy patients or in patients with MCI, a new tool was needed in order to measure NPS and to diagnose MBI as described in the 2016 ISTAART MBI criteria. Taking as a model the method used for the preparation of the other NPS focused rating scales41-44, a multidisciplinary international working group of 18 experts (psychiatrists, neuropsychiatrists, neurologists, neuroscientists, epidemiologists) was set up to create an evaluation tool, the MBI-Checklist (MBI-C)33, based on the diagnostic criteria of MBI developed by ISTAART. The aim was to make the concept of MBI operational and to allow early detection of individuals at risk of dementia, through an assessment scale that can be easily used in clinical and community settings. The Neuropsychiatric Inventory-Clinician (NPI-C44, an extended version of the NPI45, used by the clinician in heterovalutation) was taken as a reference from which certain items were selected. Items were excluded that investigated the most typical aspects of dementia, in order to identify a reduced list appropriate for the assessment of NPS in a population without established cognitive deficits. The constant interaction between members of the working group, whose purpose was to create the scale, came about using a modified version of the Delphi method 46,47, an iterative process in which items were generated and added, removed or modified, based on group input on relevance to measurement of emergent NPS in preclinical or prodromal patients. The final version of the scale consists of 34 questions, organized in the 5 MBI domains as defined by the ISTAART criteria: reduction of motivation, affective dysregulation, impulse dyscontrol, social inappropriateness and abnormal perception or thought content. Each of the 5 domains is preceded by a description of the content. The ‘reduction of motivation’ domain consists of 6 items that evaluate cognitive, emotional and behavioral apathy. Also the ‘affective dysregulation’ domain is investigated with 6 items, 4 of which focused on the aspects of depression (sad mood, anhedonia, hopelessness, feelings of guilt) and the other 2 focused on aspects of anxiety and panic. The ‘impulse dyscontrol’ is the most investigated with 12 questions relating to the presence of agitation, aggression, impulsivity, eating dyscontrol, dangerous behavior and alteration of the reward system. The ‘social inappropriateness’ domain includes 5 items, which assess social graces, empathy and tact, as well as 5 items that explore the ‘abnormal perceptions or thought content’ (including suspiciousness, grandiosity, visual and auditory hallucinations). The answer to the questions is dichotomous: the presence or absence of the item is evaluated; if the symptom is present, the interviewee is asked to specify the severity (mild, moderate, severe). Examples are provided to facilitate the understanding of the question. Behavior changes, observable by others, must have occurred in older age (≥50 years) and must persist for at least 6 months, determining a functional impairment and representing a change in the way the patient typically acts33. The scale is designed to be used in both clinical and research settings. It should be administered preferably to a family member or to a caregiver and not to the patient. In any event the clinician can indicate on the form who supplied the information (the clinician himself, an informant, the subject). No training is required to administer the scale. In an epidemiological study on a sample of 1377 elderly people (between 72 and 79 years of age) was found that 34.1% of the patients met criterion 1 for MBI48. The highest prevalence was found in patients with MCI (48.9%), followed by cognitively normal patients at risk (43.1%) and by the group of the cognitively normal (27.6%). These results, comparable with those of the Mayo Clinic Study of Ageing19, supported the interpretation of MBI as a transition stage between normality and pathological aging. It was shown that MBI was more common in the men’s group (52.65%), among which apathy and impulsive behaviors was double in prevalence to that of women. The prevalence of criterion 1 of the MBI (in accordance with the ISTAART criteria, assessed by the NPI-Q39) was evaluated in a series of patients with subjective cognitive decline and MCI, who accessed a memory clinic7. The prevalence of MBI in this study was high (81.5%) and associated with greater caregiver burden, with no significant differences between the two groups. Of note, these studies utilized the NPI or NPI-Q for symptom detection, with NPS transformed to MBI domains using an algorithm. The high prevalence likely reflects the short reference range of 4 weeks of the NPI. Recently, administering the MBI-C by phone to a sample of 127 primary care patients with subjective cognitive decline, a lower prevalence of MBI was observed, equal to 5.8%49. This variability compared to the results of previous studies is due to the use, in different settings, of different evaluation scales and criteria. In particular, in this last study the prevalence of the MBI was estimated on the basis of all 4 ISTAART criteria and through the MBI-C, which, compared to the NPI-Q, analyzes a longer period of time and emphasizes the late onset, minimizing the inclusion of transient NPS and therefore false positives. Using ROC analysis, with a reference standard being a semi-structured clinical interview, family interview, and chart review, an MBI-C cut-point of 8.5 optimized sensitivity and specificity for MBI case detection 49. A related study in primary care patients with MCI found MBI prevalence of 14.2% with an MBI-C cut-point of 6.5 optimizing MBI case detection50. MBI-C administration appears adequate in detecting MBI cases, however longitudinal data are needed to estimate if the scale is able to identify those patients who will subsequently develop cognitive decline. Taragano et al.51 evaluated the risk of conversion to dementia of 358 patients with MCI and MBI during a 5-year follow-up, demonstrating that a greater and more rapid progression towards dementia was associated with MBI (70%), compared to patients with MCI (40%). A prospective longitudinal study has recently confirmed a high conversion risk in patients with MBI. The study52 was conducted on a sample of 348 patients over 60 years of age, who attended the Neuropsychiatric Research Unit of CEMIC University Hospital. The participants of the study were divided into 3 different groups: 96 with MBI, 87 with MCI and 165 with psychiatric disorders. A further group was made on the basis of the presence of common features between MBI patients with cognitive symptoms and MCI patients with NPS (MBI-MCI group). The percentage of patients who developed dementia after 5 years was 71.5% in the MBI group, 59.6% in the MBI-MCI group, 37.8% in the MCI group and 13.9% in the group of psychiatric patients. The results of this latest study also show that the majority of patients with MCI tend to develop AD, while patients with MBI evolve in a wider range of neurodegenerative diseases, including FTD, followed by LBD and AD. Psychiatric patients develop LBD and FTD. No patient with MCI develops LBD. An important finding from thus study was the greater dementia incidence in MBI group compared to the late life psychiatric group, emphasizing the clinical and prognostic importance of differentiating later life emergent psychiatric symptoms (MBI) from psychiatric conditions in late life, thus validating the MBI concept. 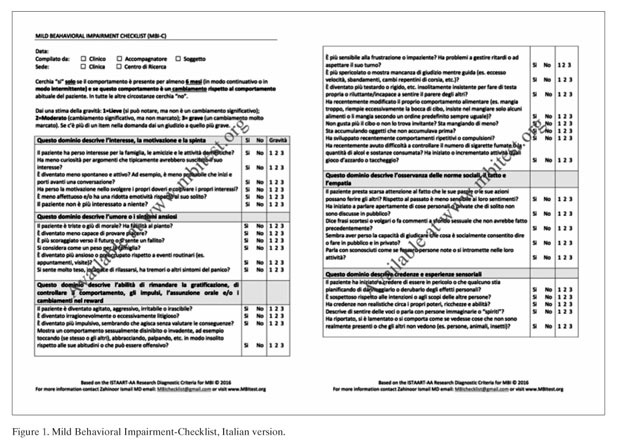 For the development of the Italian version of the MBI-Checklist the first thing carried out by our research group was a translation from English into Italian. The second step was to translate the scale back into English. These two steps were carried out by two different members of our group (C.E. and L.L. ), who worked on the translation process independently, as not to be influenced. After the translation into English the scale was sent to its main author (Z.I. ), who compared the back translation from Italian to the original English MBI-C. Discrepancies and suggestions were identified and relayed back to C.E. who incorporated them into an updated Italian translation, which was then back translated to English by L.L. and then compared again to the original by Z.I. and the process was repeated. This iterative process resulted in an Italian translation that best reflected the meaning and intention of the original MBI-C. The Italian version of the scale is shown in Figure 1 (you can obtain information about the scale and its versions in different languages ​​on the site www.mbitest.org). The MBI-C is freely available in the public domain for clinical and research use. The nosographic and diagnostic systems used today in the psychiatric field (DSM, ICD) have revealed to be inadequate for the correct definition and classification of late-onset NPS, which often precede the beginning of the neurodegenerative disease and accompany its early stages. The availability of operative diagnostic criteria, modeled on the MBI, as defined by the ISTAART-AA working group, can allow the recognition and correct classification of these symptoms, often confused with affective or psychotic clinical presentation of the senile age. The identification of a population at risk for neurodegenerative disease has important implications on the therapeutic management of affective, psychotic and behavioral symptoms and on the prevention of cognitive decline. The pharmacological choices in this population are based on avoiding all those strategies that can accelerate the progression of the disease (use of sedatives, anticholinergic drugs, high doses of antidepressants and antipsychotics, etc.). Numerous studies have shown how it was possible in some countries to reduce the incidence of dementia thanks to prevention strategies, risk factor control, lifestyle modification and social changes53-55. The early detection of MBI, made possible by the MBI-C, could allow the study and implementation of new strategies for the prevention and treatment of neurodegenerative diseases, at its early stage56. In particular, it will be interesting to verify if the early and correct treatment of late-onset NPS can mitigate, slow down or modify the clinical presentation of neurodegenerative diseases. The MBI-C33 was developed to define, identify and evaluate late-onset NPS. The use of MBI-C allows researchers to investigate the presence of a selected list of NPS in order to identify the prodromal and/or preclinical stages of dementia, estimating the risk of evolution in a neurodegenerative disease. The use of a standardized diagnostic tool such as MBI-C contributes to the early recognition of psychiatric clinical presentation and behavioral disorders developed in patients at risk, in the pre-dementia development phase, allowing the use of present and future treatments in an early stage of the disease. The reliability, validity and usefulness of MBI-C must still be evaluated and studies on different patient populations (healthy patients, patients with MBI and MCI) are necessary for this purpose. The ability of the MBI-C to accurately measure MBI domains as described in the MBI criteria is an important feature of this scale. Some symptoms may be risk factors for dementia, while others may be simple markers of cognitive decline. Different domains may confer different risks for different types of dementia, and may have different biomarkers or treatment approaches. Future studies, both cross-sectional and longitudinal will verify whether the symptoms identified by the MBI-C may represent a possible target for early pharmacological and non-pharmacological therapeutic interventions, as highlighted in the ISTAART MBI research agenda 12. Authors contributions: CE, LL and ZI worked on the MBI-C translation process. CE, LL, GP and ZI wrote the paper; and SB, CM and PM revised the manuscript. All authors read and approved the final manuscript. Conflict of interests: the authors have no conflict of interests to declare. 1. Lyketsos CG, Carrillo MC, Ryan JM, et al. Neuropsychiatric symptoms in Alzheimer’s disease. Alzheimers Dement 2011; 7: 532-9. 2. Finkel SI, Costa e Silva JA, Cohen G, Miller S, Sartorius N. Consensus statement behavioral and psychological signs and symptoms of dementia: a consensus statement on current knowledge and implications for research and treatment. Int Psychogeriatr 1996; 8 Suppl 3: 497-500. 3. Lyketsos CG, Lopez O, Jones B, Fitzpatrick AL, Breitner J, Dekosky S. Prevalence of Neuropsychiatric Symptoms Results From the Cardiovascular Health Study. JAMA 2002; 288: 1475-83. 4. Lanctôt KL, Amatniek J, Ancoli-Israel S, et al. Neuropsychiatric signs and symptoms of Alzheimer’s disease: new treatment paradigms. Alzheimers Dement (N Y) 2017; 3: 440-9. 5. González-Salvador T, Lyketsos CG, Baker A, et al. Quality of life in dementia patients in long-term care. Int J Geriatr Psychiatry 2000; 15: 181-9. 6. Lyketsos CG, Breitner JCS, Rabins PV. An evidence-based proposal for the classification of neuropsychiatric disturbance in Alzheimer’s disease. Int J Geriatr Psychiatry 2001; 16: 1037-42. 7. Sheikh F, Ismail Z, Mortby ME, et al. Prevalence of mild behavioral impairment in mild cognitive impairment and subjective cognitive decline, and its association with caregiver burden. Int Psychogeriatr 2018; 30: 233-44. 8. Geda YE, Schneider LS, Gitlin LN, et al. ; Neuropsychiatric Syndromes Professional Interest Area of ISTAART. Neuropsychiatric symptoms in Alzheimer’s disease: past progress and anticipation of the future. Alzheimers Dement 2013; 9: 602-8. 9. Devineni B, Onyike CU. Young-onset dementia epidemiology applied to neuropsychiatry practice. Psychiatr Clin North Am 2015; 38: 233-48. 10. Rojas G, Bartoloni L, Dillon C, Serrano CM, Iturry M, Allegri RF. Clinical and economic characteristics associated with direct costs of Alzheimer’s, frontotemporal and vascular dementia in Argentina. Int Psychogeriatr 2011; 23: 554-61. 11. Peters ME, Schwartz S, Han D, et al. Neuropsychiatric symptoms as predictors of progression to severe Alzheimer’s dementia and death: the cache county dementia progression study. Am J Psychiatry 2015; 172: 460-5. 12. Mortby ME, Lyketsos CG, Geda YE, Ismail Z. Special issue on mild behavioral impairment and non-cognitive prodromes to dementia. Int Psychogeriatr 2018; 30: 167-9. 13. Masters MC, Morris JC, Roe CM. “Noncognitive symptoms” of early Alzheimer disease: a longitudinal analysis. Neurology 2015; 84: 617-22. 14. Geda YE, Roberts RO, Mielke MM, et al. Baseline neuropsychiatric symptoms and the risk of incident mild cognitive impairment: a population-based study. Am J Psychiatry 2014; 171: 572-81. 15. Brodaty H, Heffernan M, Draper B, et al. Neuropsychiatric symptoms in older people with and without cognitive impairment. J Alzheimers Dis 2012; 31: 411-20. 16. Banks SJ, Raman R, He F, et al. The Alzheimer’s disease cooperative study prevention instrument project: longitudinal outcome of behavioral measures as predictors of cognitive decline. Dement Geriatr Cogn Dis Extra 2014; 4: 509-16. 17. Peters ME, Rosenberg PB, Steinberg M, et al. Prevalence of neuropsychiatric symptoms in CIND and its subtypes: the cache county study. Am J Geriatr Psychiatry 2012; 20: 416-24. 18. Feldman H, Scheltens P, Scarpini E, et al. Behavioral symptoms in mild cognitive impairment. Neurology 2004; 62: 1199-201. 19. Geda YE, Roberts RO, Knopman DS, et al. Prevalence of neuropsychiatric symptoms in mild cognitive impairment and normal cognitive aging: population-based study 97. Arch Gen Psychiatry 2008; 65: 1193-8. 20. Rosenberg PB, Mielke MM, Appleby BS, Oh ES, Geda YE, Lyketsos CG. The association of neuropsychiatric symptoms in MCI with incident dementia and alzheimer disease. Am J Geriatr Psychiatry 2013; 21: 685-95. 21. Ismail Z, Elbayoumi H, Fischer CE, et al. Prevalence of depression in patients with mild cognitive impairment: a systematic review and meta-analysis. JAMA Psychiatry 2017; 74: 58-67. 22. Petersen RC, Stevens JC, Ganguli M, et al. Practice parameter: early detection of dementia: Mild Cognitive Impairment (an evicence-based review). Neurology 2001; 56: 1133-42. 23. Quattropani MC, Lenzo V, Armieri V, et al. L’origine della depressione nella malattia di Alzheimer: una revisione della letteratura. Riv Psichiatr 2018; 53: 18-30. 24. Ismail Z, Gatchel J, Bateman DR, et al. Affective and emotional dysregulation as pre-dementia risk markers: exploring the mild behavioral impairment symptoms of depression, anxiety, irritability, and euphoria. Int Psychogeriatr 2018; 30: 185-96. 25. McKhann GM, Knopman DS, Chertkow H, et al. The diagnosis of dementia due to Alzheimer’s disease: recommendations from the National Institute on Aging-Alzheimer’s Association workgroups on diagnostic guidelines for Alzheimer’s disease. Alzheimers Dement 2011; 7: 263-9. 26. Steinberg M, Shao H, Zandi P, et al. ; Cache County Investigators. Point and 5-year period prevalence of neuropsychiatric symptoms in dementia : the Cache County Study. Int J Geriatr Psychiatry 2008; 23: 170-7. 27. Lyketsos CG, Steele C, Baker L, et al. Major and minor depression in Alzheimer’s disease: prevalence and impact. J Neuropsychiatry Clin Neurosci 1997; 9: 556-61. 28. Lindau M, Almkvista O, Kushi J, et al. First symptoms – Frontotemporal dementia versus Alzheimer’s disease. Dement Geriatr Cogn Disord 2000; 11: 286-93. 29. Ismail Z, Smith EE, Geda Y, et al. Neuropsychiatric symptoms as early manifestations of emergent dementia: provisional diagnostic criteria for mild behavioral impairment. Alzheimers Dement 2016; 12: 195-202. 30. Auning E, Rongve A, Fladby T, et al. Early and presenting symptoms of dementia with Lewy bodies. Dement Geriatr Cogn Disord 2011; 32: 202-8. 31. Jauhar S, Ritchie S. Psychiatric and behavioural manifestations of Huntington’s disease. Adv Psychiatr Treat 2010; 16: 168-75. 32. Woolley JD, Khan BK, Murthy NK, Miller BL, Rankin KP. The diagnostic challenge of psychiatric symptoms in neurodegenerative disease: rates of and risk factors for prior psychiatric diagnosis in patients with early neurodegenerative disease. J Clin Psychiatry 2011; 72: 126-33. 33. Ismail Z, Agüera-Ortiz L, Brodaty H, et al. The Mild Behavioral Impairment Checklist (MBI-C): a rating scale for neuropsychiatric symptoms in pre-dementia populations. J Alzheimers Dis 2017; 56: 929-38. 34. Taragano FE, Allegri RF. Mild behavioral impairment: the early diagnosis. In: The Eleventh International Congress of the International Psychogeriatric Association. Chicago, Illinois; 2003: 17-22. 35. de Mendonça A, Ribeiro F, Guerreiro M, Garcia C. Frontotemporal mild cognitive impairment. J Alzheimers Dis 2004; 6: 1-9. 36. Sherman C, Liu CS, Herrmann N, Lanctôt KL. Prevalence, neurobiology, and treatments for apathy in prodromal dementia. Int Psychogeriatr 2018; 30: 177-84. 37. Desmarais P, Lanctôt KL, Masellis M, Black SE, Herrmann N. Social inappropriateness in neurodegenerative disorders. Int Psychogeriatr 2018; 30: 197-207. 38. Agüera-Ortiz LF, López-Álvarez J, Del Nido-Varo L, Soria García-Rosel E, Pérez-Martínez DA, Ismail Z. Deterioro comportamental leve como antecedente de la demencia: presentación de los criterios diagnósticos y de la versión española de la escala MBI-C para su valoración. Rev Neurol 2017; 65: 327-34. 39. Kaufer DI, Cummings JL, Ketchel P, et al. Validation of the NPI-Q, a Brief Clinical Form of the Neuropsychiatric Inventory. J Neuropsychiatry Clin Neurosci 2000; 12: 233-9. 40. Reisberg B, Monteiro I, Torossian C, et al. The BEHAVE-AD assessment system: a perspective, a commentary on new findings, and a historical review. Dement Geriatr Cogn Disord 2014; 38: 89-146. 41. Miller RJ, Snowdon J, Vaughan R. The use of the Cohen-Mansfield Agitation Inventory in the assessment of behavioral-disorders in nursing-homes. J Am Geriatr Soc 1995; 43: 546-9. 42. Sultzer D, Levin H, Mahler M, High W, Gummings J. Assessment of cognitive, psychiatric, and behavioral disturbances in patients with dementia: the Neurobehavioral Rating Scale. J Am Geriatr Soc 1992; 40: 549-55. 43. Reisberg B, Auer SR, Monteiro IM. Behavioral pathology in Alzheimer’s disease (BEHAVE-AD) rating scale. Int Psychogeriatr 1996; 8 (suppl 3): 301-8. 44. De Medeiros K, Robert P, Gauthier S, et al. The Neuropsychiatric Inventory-Clinician rating scale (NPI-C): reliability and validity of a revised assessment of neuropsychiatric symptoms in dementia. Int Psychogeriatr 2010; 22: 984-94. 45. Cummings JL, Mega M, Gray K, Rosenberg-Thompson S, Carusi DA, Gornbein J. The Neuropsychiatric Inventory: comprehensive assessment of psychopathology in dementia. Neurology 1994; 44: 2308-14. 46. Fink A, Kosecoff J, Chassin M, Brook RH. Consensus methods: characteristics and guidelines for use. Am J Public Health 1984; 74: 979-83. 47. Milholland AV, Wheeler SG, Heieck JJ. Medical assessment by a Delphi Group Opinion Technic. N Engl J Med 1973; 288: 1272-5. 48. Mortby ME, Ismail Z, Anstey KJ. Prevalence estimates of mild behavioral impairment in a population-based sample of pre-dementia states and cognitively healthy older adults. Int Psychogeriatr 2018; 30: 221-32. 49. Mallo SC, Ismail Z, Pereiro AX, et al. Assessing mild behavioral impairment with the mild behavioral impairment checklist in people with subjective cognitive decline. Int Psychogeriatr 2018: 1-9. 50. Mallo SC, Ismail Z, Pereiro AX, et al. Assessing Mild Behavioral Impairment with the Mild Behavioral Impairment-Checklist in people with Mild Cognitive Impairment. J Alzheimers Dis 2018; 66: 83-95. 51. Taragano FE, Allegri RF, Krupitzki H, et al. Mild behavioral impairment and risk of dementia: A prospective cohort study of 358 patients. J Clin Psychiatry 2009; 70: 584-92. 52. Taragano FE, Allegri RF, Heisecke SL, et al. Risk of conversion to dementia in a Mild Behavioral Impairment Group compared to a Psychiatric Group and to a Mild Cognitive Impairment Group. J Alzheimers Dis 2018; 62 :227-38. 53. Rocca WA, Petersen RC, Knopman DS, et al. Trends in the incidence and prevalence of Alzheimer’s disease, dementia, and cognitive impairment in the United States. Alzheimers Dement 2011; 7: 80-93. 54. Schrijvers EMC, Verhaaren BFJ, Koudstaal PJ, Hofman A, Ikram MA, Breteler MMB. Is dementia incidence declining? Trends in dementia incidence since 1990 in the Rotterdam Study. Neurology 2012; 78: 1456-63. 55. Qiu C, Von Strauss E, Bäckman L, Winblad B, Fratiglionis L. Twenty-year changes in dementia occurrence suggest decreasing incidence in central Stockholm, Sweden. Neurology 2013; 80: 1888-94. 56. Mortby ME, Black SE, Gauthier S, et al. Dementia clinical trial implications of mild behavioral impairment. Int Psychogeriatr 2018; 30: 171-5.